The Sahara Desert is impressively large, but for the most part fails to live up to the deserts of our imagination, containing gravel-strewn plains and painfully scrubby vegetation. But in pockets of the desert where tall plateaus and remorseless mountains break the wind, sediment gathers into vast sand seas called ergs. The sand in these ergs is teased by the wind into epic dunes, shifting sand that can take thousands of years to grow into monstrous structures. The erg contains a variety of dunes, from wee linear dunes form parallel to the prevailing wind, to crescent-shaped barchan dunes with their rounded backs to the wind and steep slip-faces in the lee, to picturesque star dunes in areas of complex, multi-directional winds that change with seasons and are disrupted by storms. Rare rainfall gathers in the basins between dunes, the water first dissolving salts then leaving them behind as it evaporates under the unrelenting sun. The evaporite deposits form interdune salt deposits called sabkah, blue-white areas nested in the sea of iron oxide rich red sands. With this much sand, complexity is inevitable. In this case, it means the superposition of dunes, with the smallest dunes climb up the slopes of the larger dunes, migrating in a never-ending dance of sand and wind. 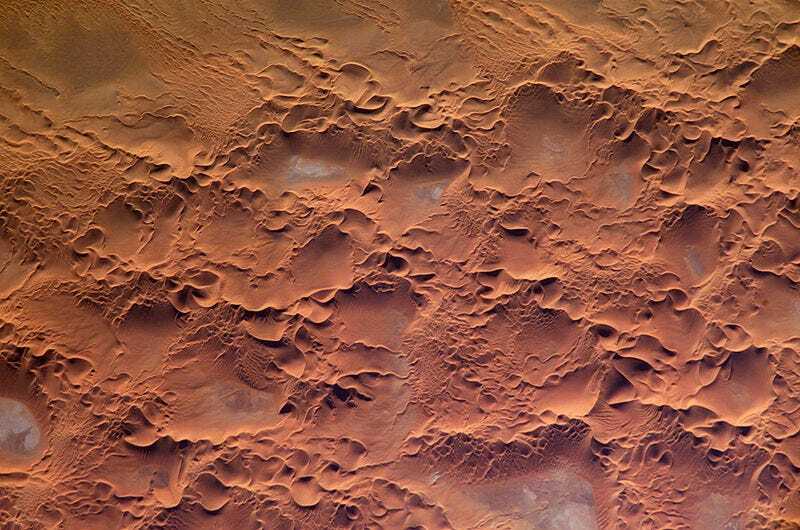 When barchan dunes and star dunes crawling across each other, they're reflecting the transition between a single dominant wind direction and a more complex variable-direction wind regime. In other places, the long strips of longitudinal dunes separated by salt flats are broken by superimposed star dunes. The contained chaos of a multi-armed mess set in tidy rows tells a two-stage history of strong southern winds creating the initial longitudinal dunes, weakening over time with weak gusts blowing out arms from central points. Each scale of dune reflects a different time domain, with the largest dunes taking the longest to accumulate. The largest mega-dunes grew over thousands of years, potentially dating back to the first arid days of the Sahara 2.5 million years ago, while the intermediate-scale meso-dunes grow, crest, and migrate on the scale of decades. The very smallest dunes are the fastest, taking just years to crawl along the surface of their larger relatives. Draa, the largest of the dunes, can reflect all the shapes of the smaller dunes depending on the wind history over their formation. From zig-zags of a variable past to long arms of a relatively steady wind regime, they are the result of the same mechanics just written large over far longer time scales. For more information on any of the individual images, follow the image credit to read about it on NASA's Earth Observatory.